I wiped my sleeve across the condensation on the inside of the bus window, trying to get a better view of the peaks surrounding me. The road meandered along the edge of the Chepelarska River, which was periodically dammed by hydroelectric plants and fringed with drooping willows. It was the heart of winter in Bulgaria, and I was escaping into the mountains for some fresh air and relaxation. The quaint Kosovo Houses were calling my name, and I was eager to immerse myself in serenity. The bus dropped me off at a small shelter in Narechenski Bani. Rain was hammering down and clouds rolled in from the hills. A car pulled up and an amiable man called my name. Christo, the co-owner of Kosovo Houses, picked me up and escorted me into the fog-drenched mountains. We exchanged pleasantries and found that despite English being my first language, and Bulgarian being Christo’s, we could settle on Spanish to be the common tongue. Soon we were driving through Kosovo Village, with centuries-old stone houses perched on narrow and winding streets. The entire town was built on a gorgeous hill, and it seemed every home held a glorious vista. We stopped outside Kosovo Houses, and we ran inside to beat the rain. Snowing at the Kosovo Houses. 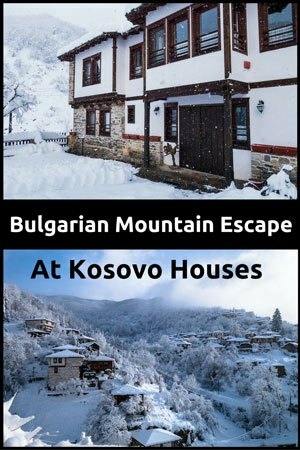 Kosovo Houses has been attracting travellers for years. Hiking trails wander through a dense pine forest in the surrounding mountains; Pamporovo, the most visited ski resort in the country, is only a 30-minute drive away. But what really draws visitors to the village is the serene setting, captivating views and the incredible owners. For 17 years Svetlana and Christo lived in Venezuela. After spending that much time away from their native land, the longing for Bulgaria proved to be too powerful, and they returned with the dream of welcoming visitors to their native homeland. Now they have become something of a legend amongst off-the-beaten-path travellers, along with their impeccable Kosovo Houses. Lovely views over Kosovo Village. What first started as the one guesthouse has now grown into three, each with their own set of unique characteristics, scattered about the village. There are about 100 dwellings around the area, but only 8 people call Kosovo Village their permanent home. The rest of the stone structures remain empty during the winter, and are only used in the summer as a holiday destination for the owners, who usually come from the capital, Sofia. A lot of snow built up in Kosovo Village. Christo showed me to an interestingly decorated room, spotless and full of character. I dropped my backpack off and headed straight to the restaurant. Svetlana and Christo told me that their Houses were built by two expert carpenters who had helped maintain the original style of local architecture over the decades. Intricate carvings adorned the architraves and cornices. I grabbed a seat and made myself comfortable – an activity I would find myself doing a lot over the next few days. My beautiful bedroom at Kosovo Houses. The small living area on the top floor, outside my bedroom. “Snow is in the forecast,” Svetlana mused as I gazed out at the village. I settled into the onsite Tavern with a beer, petting Miso, the cat that showed up one day in September and never left. Not long after Svetlana’s prediction, the raindrops began to freeze, and soon heavy snowflakes were falling from the sky. Christo walked in, and we all gathered by the window to watch the flakes build up on the trees. I enjoyed a delectable and traditional chicken dish for dinner, and it was a welcome change to the typical doner kebabs I always find myself eating in this part of the world. With stomachs full, Christo got the fire roaring, and we talked well into the night. Eventually, it was time to retire, and I stepped outside of the warmth. The snow was accumulating on the ground, and I found myself standing in the darkness, staring up at the thousands of flakes floating to the earth. Despite the dropping temperature, I found it hard to break away from the hypnotising beauty high up in the mountains. It was still snowing when I woke in the morning. I cracked open the curtain and was amazed to see the entire countryside covered in over a foot of fresh, undisturbed powder. Quickly putting on my warmest clothes, I ran out into the silent environment. Ever since I first moved to Canada, I have never found anything to be as beautiful as the mountains covered in a blanket of deep snow. Svetlana was shovelling the path, and called out merrily, “Well, I guess the forecast was right!” I laughed and went inside the Tavern for a fresh cup of coffee and breakfast. I was the first of the few guests to rise, and started chatting with Christo and Svetlana’s son about life in the mountains. The power had cut out during the evening, and the roads were completely closed. Essentially we were stranded in the Bulgarian mountainside. I couldn’t help but think, what a wonderful place to be stuck! All this talk of fresh air forced me to get away from the fireplace, and outside to do some exploring. The sun peaking through on beautiful Bulgarian morning. With the snow over knee deep, I trekked uphill and away from Kosovo Houses. The sun was high in the sky now, and beams of light were shining through the snow-speckled trees. I trudged on and found myself on a narrow path. For the next hour, I hiked and soaked up the tranquil scenery. The last time I had experienced this much snow was in Arslanbob, Kyrgyzstan, over 5 months prior. I was in overwhelmed with happiness, being engulfed in the white beauty. Unfortunately, my clothing and shoes were not adequate for deep winter exploration, and soon enough my feet were completely frozen. I reluctantly turned back, defeated by the cold but elated with my surroundings. I could only imagine how epic the hiking would be in the summer. It might not seem like anything amazing, but for someone who spends their life on the road writing about experiences, being able to sit back and soak up someone else’s travel stories was invigorating. With Paul Theroux guiding me along his Great Railway Bazaar, I let the hours pass by in uninterrupted bliss. My view while I read. Svetlana cooked up another delicious Bulgarian dinner, and we all enjoyed another long fireplace conversation about life in Venezuela and abroad. Darkness kicked in, and with no power to light the way, we sat by candlelight. Bedtime called, and I found myself back in my room at 9 pm. We were amazed to discover that the electricity was still cut in the morning, and the roads were still blocked. I had been booked in to stay another night, but with no certainty of what weather was in the forecast, I made the sad decision to leave a day early. Alesha was due to fly back into Istanbul in two days time, and as much as I loved the idea of being stranded in the Bulgarian mountainside, I had to be there to see her at the airport. Svetlana made some calls and determined that the road from Kosovo Village to the highway would be cleared after lunch. I packed my backpack and headed into the heart of the village. The family came down to see me off, and they loaded me into a milk truck owned by a local farmer. He graciously offered to drop me in town so I could hitchhike back to Plovdiv. I waved goodbye to Svetlana and Christo, and promised I would return in the summer with Alesha. My time at Kosovo Houses was far too short, but it was one of the most relaxing breaks I had experienced in months. The snowfall created a perfect ambiance to accompany the peaceful setting. And whenever I think of Bulgaria, I’ll always think of the time I was stranded in the mountains, in the idyllic Kosovo Houses. My accommodation was graciously covered by Svetlana and Christo of Kosovo Houses. All thoughts and ramblings are of course my own. Hey, Jarryd, you are a man of eloquence and sweet words when it comes to describing a story. As a Bulgarian travel blogger, I am so happy you had to experience being stranded in the best way – in a cosy, warm place with lip-smacking meals and up, up (and away) in the mountains. nice place thanks for the recommend ,i feel close there . I has encountered these deep snow at a small village near Kielce in Poland, it was so amazing white beauty, during winter with the family who invited me to their old style of Polish wooden house. Whereby when the snow had grown knee-deep a naked man in the family, ran out make a hole in the snow and take deep sleep inside. They say if you feel healthy you can try it then I try for less than a minute. Lovely post! Enjoy your travel time.